Mouse anti Chicken monocytes/macrophages antibody, clone KUL01 (MCA5770) used for flow cytometry studies. 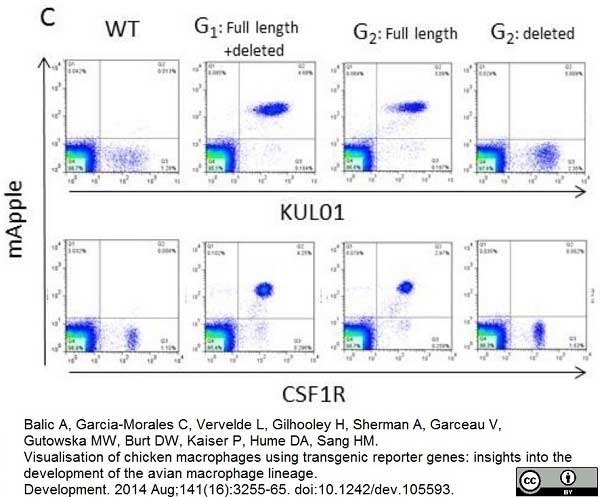 (C) Flow cytometric analysis of reporter transgene expression in KUL01+/CSF1R+ blood monocytes in a non-transgenic chicken, G1 cockerel MAA1-8:23 and representative G2 progeny from (B) that have either a full length or a partially-deleted insert. From: Balic A, Garcia-Morales C, Vervelde L, Gilhooley H, Sherman A, Garceau V, Gutowska MW, Burt DW, Kaiser P, Hume DA, Sang HM. Visualisation of chicken macrophages using transgenic reporter genes: insights into the development of the avian macrophage lineage. Mouse anti Chicken monocytes/macrophages antibody, clone KUL01 (MCA5770) used for Immunohistochemistry. Immunohistochemical evidence of infiltration by T-cells (CD3+), B-cells (chB6+) and macrophages (Kul01+). Immunophenotyping identified the majority of infiltrating lymphocytes as being CD3-positive T-cells (A). They show a characteristic multifocal distribution pattern. With similar spatial characteristics, chB6-positive B-cells comprise the second largest fraction of infiltrating cells (B). Compared to the lymphocytes, the density of Kul01-positive macrophages appears much lower (C). The arrows point to immunopositive cells. All sections were prepared from the same region of the sciatic nerve. The orientation of the nerve fibres (NF) is indicated. Scale bar = 35μm. 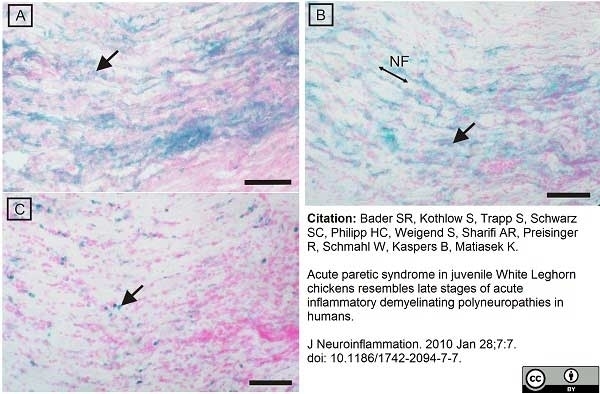 From: Bader SR, Kothlow S, Trapp S, Schwarz SC, Philipp HC, Weigend S, Sharifi AR, Preisinger R, Schmahl W, Kaspers B, Matiasek K.
Acute paretic syndrome in juvenile White Leghorn chickens resembles late stages of acute inflammatory demyelinating polyneuropathies in humans. J Neuroinflammation. 2010 Jan 28;7:7. Mouse anti Chicken Monocytes/Macrophages, clone KUL01 recognises chicken monocytes and macrophages. Clone KUL01 will also detect interdigitating cells and activated microglia but does not recognise Bu1+ve B-cells or CD3 +ve T-lymphocytes. Mast, J. et al. (1998) Characterisation of chicken monocytes, macrophages and interdigitating cells by the monoclonal antibody KUL01. Vet Immunol Immunopathol. 61 (2-4): 343-57. Wigley, P. et al. (2001) Salmonella enterica serovar Pullorum persists in splenic macrophages and in the reproductive tract during persistent, disease-free carriage in chickens. Infect Immun. 69 (12): 7873-9. Garcia-Morales, C. et al. (2014) Production and characterisation of a monoclonal antibody that recognises the chicken CSF1 receptor and confirms that expression is restricted to macrophage-lineage cells. Dev Comp Immunol. 42 (2): 278-85. Guabiraba, R. et al. (2017) Unveiling the participation of avian kinin ornithokinin and its receptors in the chicken inflammatory response. Vet Immunol Immunopathol. 188: 34-47.